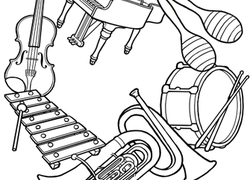 Our collection of music worksheets introduce kids to music history, different kinds of instruments, song lyrics, sheet music, and more. These music worksheets are perfect for kids who take music classes at school or in extracurricular programs, but they are also great for kids who have yet to discover their musical ability. Got a budding Beethoven on your hands? Build your child's interest in music with this fun worksheet to help him learn to read the notes on a piano. Got a master musician in the making? Give her tunes some solid structure with a fun beginner's worksheet on reading music. Your child will learn about the history of music and the history of segregation in America with this Motown worksheet. If your kid loves music, try this fun approach to learn the guitar! He'll get to know the basic parts of the guitar and the notes it plays. Inspire your budding singer with a fun singalong worksheet featuring a childhood favorite, "Head, Shoulders, Knees and Toes"! Masterful musicians can learn the origins of the piano with this music history worksheet. Learn more about a patriotic piece of history with this informational page on the original Star-Spangled Banner. Does your child love music? This mandala coloring page is sure to please. Exercise your vocal chords with a fun singalong page, featuring "I'm a Little Teapot"! Kids can learn about rhyme and rhythm as they sing. Colour in the pictures that go with the classic nursery rhyme "Frere Jacques."